Craft projects can be a great way to decorate your room and give it your own style. Have you seen a cool lampshade, groovy trash can or fun wall letters decorating the dream rooms shown in magazines and catalogs? Instead of buying something new and expensive, why not update what you already have? You can be creative, have fun, save some green and go green by reusing things around the house. 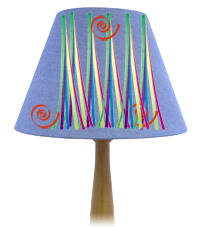 Brighten up that plain white lampshade. Use lengths of colorful ribbon to trim the edges or cut bits of wide ribbon into shapes and glue into place with fabric glue. Be sure to always use the manufacturer’s recommended wattage light bulb. Spice up that standard, store-bought trash can. A small, plain trash can, craft glue, acrylic paints, craft paintbrush, glitter glue; interesting things you’ve found or collected, such as postcards or seashells. 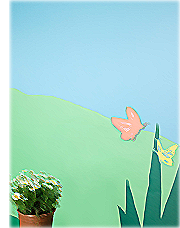 Use bright acrylic paints or glitter glue to add pizzazz and personality. Add items you’ve found such as seashells and beach glass. Glue on a bunch of your favorite postcards, greeting cards or magazine pictures. From random swirls to a detailed beach scene, you can create a one-of-a-kind, stylish place to stash your trash. Cut a piece of old bed sheet to large enough fit over an old picture frame, with an extra two inches of fabric all the way around. Stretch the fabric over the frame. Secure the fabric to the back of the frame using thumbtacks or an upholstery staple gun, if you happen to have one. Use a variety of materials, such as paint, buttons, ribbon and colorful tissue paper to create your own mixed-media art piece. Dream big, groovy girl. Personalize your room with your favorite phrase or your name using letters you can make yourself. Draw big, chunky letters on pieces of cardboard from old boxes. Cut out the letter shapes. Decorate each cardboard letter with wrapping paper, fabric, ribbon, paint, glitter glue, foam shapes, stickers or anything else you have. Mix and match colors and materials for a one-of-a-kind look. Stick the letters right to the wall or hang them on a wall or from a curtain rod. To hang the letters, punch a hole in the top of each letter and put an 8-inch piece of ribbon through the hole. Tie the ribbon ends together to make a hanger.